Earn “Sweat Equity” Points for attending class, workshops and tagging Bikram Yoga North Texas in a post on twitter or facebook. Come to class and “sign in” using your key card. Once your account is set up on Perkville, you can view your points, see what you can redeem points for, post on facebook or twitter and print off vouchers for free stuff. 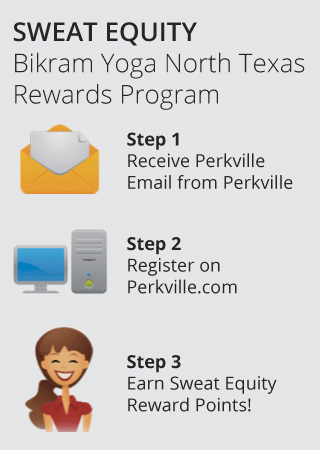 Log in to Perkville and use their system to post on facebook or twitter and tag Bikram Yoga North Texas in the post. Every time you do this, you get points! Must be done through Perkville website. When you have enough points to redeem, print out the appropriate voucher through Perkville and bring it to the studio for redemption. Then, take class and start earning more points! 1000 points – Free month of yoga. Simply practice 3-4 times a week and you will earn a free month every year.